Oregon ( pronounced [ˈɔ.ɹɪ.ɡən], [ˈo.ɹɪ.ɡən]) is a state in the Pacific Northwest region of the United States. Oregon borders the Pacific Ocean on the west, Washington on the north, Idaho on the east, and California and Nevada on the south. The Columbia and Snake Rivers form, respectively, much of its northern and eastern borders. Between two north-south mountain ranges in western Oregon—the Pacific Coast Range and the Cascade Mountain Range—lies the Willamette Valley, the most densely populated and agriculturally productive region of the state. Oregon's population in 2000 was 3,421,399, a 20.4% increase over 1990. The Census Bureau estimated Oregon's population to have reached 3,594,586 by 2004. Oregon's earliest residents were several Native American tribes, including the Bannock, Chinook, Klamath, and Nez Perce. James Cook explored the coast in 1778 in search of the Northwest Passage. The Lewis and Clark Expedition traveled through the region during their expedition to explore the Louisiana Purchase. They built their winter fort at Fort Clatsop, near the mouth of the Columbia River. Exploration by Lewis and Clark (1805–1806) and the United Kingdom's David Thompson (1811) publicized the abundance of fur-bearing animals in the area. In 1811, New York financier John Jacob Astor established Fort Astoria at the mouth of the Columbia River as a western outpost to his Pacific Fur Company. Fort Astoria was the first permanent white settlement in Oregon. In the War of 1812, the British gained control of all of the Pacific Fur Company posts. In 1841, the master trapper and entrepreneur Ewing Young died with considerable wealth, with no apparent heir, and no system to probate his estate. A meeting followed Young's funeral at which a probate government was proposed. Doctor Ira Babcock of Jason Lee's Methodist Mission was elected Supreme Judge. Babcock chaired two meetings in 1842 at Champoeg—half way between Lee's mission and Oregon City—to discuss wolves and other animals considered troublesome at the time. These meetings were precursors to an all-citizen meeting in 1843, which instituted a provisional government headed by an executive council made up of David Hill, Alanson Beers, and Joseph Gale. This government was first of several acting governments of the Oregon Country (also referred to as the Republic of Oregon) prior to American annexation. The Oregon Trail infused the region with new settlers, starting in 1842–43, after the United States agreed to jointly settle the Oregon Country with the United Kingdom. The border was resolved in 1846 by the Oregon Treaty after a period during which it seemed that the United States and the United Kingdom would go to war for a third time in 75 years. Cooler heads prevailed, and the Oregon boundary dispute between the United States and British North America was set at the 49th parallel. The Oregon Territory was officially organized in 1848. At the outbreak of the American Civil War, regular U.S. troops were withdrawn and sent east. Volunteer cavalry were recruited in California and were sent north to Oregon to keep peace and protect the populace. The First Oregon Cavalry served until June 1865. Industrial expansion began in earnest following the construction of the Bonneville Dam in 1943 on the Columbia River. The power, food, and lumber provided by Oregon helped fuel the development of the west, although the periodic fluctuations in the nation's building industry have hurt the state's economy on multiple occasions. The state has a long history of polarizing conflicts: Native Americans vs. British fur trappers, British vs. settlers from the U.S., ranchers vs. farmers, wealthy growing cities vs. established but poor rural areas, loggers vs. environmentalists, white supremacists vs. anti-racists, social progressivism vs. small-government conservatism, supporters of social spending vs. anti-tax activists, and native Oregonians vs. Californians (or outsiders in general). Oregonians also have a long history of secessionist ideas, ranging from varying parts of the population on all sides of the political spectrum attempting to form other states and even other countries. (See: State of Jefferson, State of Klamath, State of Shasta and Cascadia.) Oregon state ballots often include politically conservative proposals (e.g. anti-gay, pro-religious measures) side-by-side with politically liberal ones (e.g. drug decriminalization), illustrating the wide spectrum of political thought in the state. The origin of the state's name is something of a mystery. The earliest known use of this proper noun was in a 1765 petition by Major Robert Rogers to the Kingdom of Great Britain. The petition referred to Ouragon and asked for money to finance an expedition in search of the Northwest Passage. In 1766, Rogers commissioned Jonathan Carver to lead such an expedition and in 1778, Carver used Oregon to label the Great River of the West in his book Travels Through the Interior Parts of North America. The poet William Cullen Bryant took the name from Carver's book and used it in his poem Thanatopsis to refer to the recent discoveries of the Lewis and Clark Expedition; this use helped establish it in modern use. During the time of the Hudson's Bay Company and the voyages of Robert Gray, some say the indigenous peoples of the Pacific Northwest referred to the Columbia River as the great "Ouragon". Since the Columbia River is perhaps the most significant geographic feature of the region, it is plausible that the name was anglicized to Oregon and thence became known as such. Others derive the name as a corruption of the French word ouragan (hurricane), referring to the tumultuous nature of the Columbia River. George R. Stewart argued in a 1944 article in American Speech that the name came from an engraver's error in a French map published in the early 1700s, on which the Ouisiconsink ( Wisconsin River) was spelled "Ouaricon-sint", broken on two lines with the -sint below, so that there appeared to be a river flowing to the west named "Ouaricon". This theory was endorsed in Oregon Geographic Names as "the most plausible explanation". An abundance of Beavers gave Oregon the nickname the Beaver State. In 2001, archaeologist Scott Byram and David G. Lewis published an article in the Oregon Historical Quarterly arguing that the name Oregon came from the word oolighan, referring to grease made from fish, which the Native Americans of the region traded in. Those trade routes brought the term eastward. Less supported theories are based on it having a Spanish etymology. The theory that it comes from oregano, was dismissed years ago by Henry W. Scott, an early editor of The Oregonian. He wrote that it was "a mere conjecture absolutely without support. More than this, it is completely disproved by all that is known of the name." Others have speculated that the name is related to the kingdom of Aragon: the major part of the Spanish soldiers that conquered the West Coast from California to Vancouver Island in the 18th century were, in fact, from Catalonia, a principate of the ancient Crown of Aragon in Spain. Oregon's geography may be split roughly into six areas: the Coast Range, the Willamette Valley, the Cascade Mountains the Klamath Mountains, the Columbia River Plateau, and the Basin and Range Region. The state varies from rainforest in the Coast Range to barren desert in the southeast, which still meets the technical definition of a frontier. Its highest point is the summit of Mount Hood, at 11,239 feet (3,428 m), and its lowest point is sea level of the Pacific Ocean. Its mean elevation is 3,300 feet (1,006 m). Crater Lake National Park is the state's only national park, and the site of Crater Lake, the deepest lake in the U.S. at 1,943 feet (592 m). Similar federally owned, protected recreation areas that are entirely in Oregon include: John Day Fossil Beds National Monument, Newberry National Volcanic Monument, Cascade-Siskiyou National Monument and Oregon Caves National Monument. Oregon claims the D River is the shortest river in the world, though the American state of Montana makes the same claim of its Roe River. Guinness World Records has declared that the two rivers are the same length and can both claim the honour. Oregon is also home to the smallest park in the world, Mill Ends Park in Portland. The climate of the state is largely influenced by the Pacific Ocean, although much less so in the east than near the ocean. Generally, the climate is mild, although extreme weather can and does happen. Precipitation in the state varies widely with a low of 8 annual inches in some eastern plateaus and close to 200 inches on some western coastal slopes. The flags of the United States and Oregon flown side-by-side in downtown Portland. Governors in Oregon serve four-year terms and are limited to two consecutive terms, but an unlimited number of total terms. The Secretary of State serves as Lieutenant Governor for statutory purposes. The other constitutional officers are Treasurer, Attorney General, Superintendent of Public Instruction and Labor Commissioner. 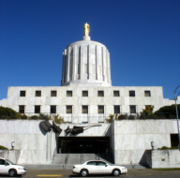 The Oregon Legislative Assembly consists of a thirty-member State Senate and sixty-member House. Senators serve four-year terms, and Representatives two. The state supreme court has seven elected justices, including the only openly gay state supreme court justice in the nation, Rives Kistler. They choose one of their own to serve a six-year term as Chief Justice. The only court that may reverse or modify a decision of the Oregon Supreme Court is the United States Supreme Court. Oregon is one of the few states whose legislature is biennial. The debate over whether to move to annual sessions is a long-standing battle in Oregon politics, but the voters have resisted the move from citizen legislators to professional lawmakers. Because Oregon's state budget is written in two year increments and, having no sales tax, its revenue is based largely on income taxes, it is often significantly over- or under-budget. Recent legislatures have had to be called into special session repeatedly to address revenue shortfalls resulting from economic downturns, bringing to a head the need for more frequent legislative sessions. State legislators are personally liable for any deficit. Oregon is currently seen as a moderate Democratic-leaning state, which has voted for that party in every presidential election since 1988. However, in 2000, Gore won only eight of Oregon's 36 counties, and in 2004, Kerry won just seven, losing in populous, traditionally Democratic Clackamas County. The politics of the state are largely similar to those of neighboring Washington, and like Washington, are closely divided between metropolitan and rural areas. The state legislature is split between the two parties, with Republicans dominating the House of Representatives and Democrats controlling the Senate. In the 2004 general election, the voters banned gay marriage by a vote of 57 to 43 percent, and weakened land use laws across the state. In 2002, voters narrowly elected a Democratic governor. Entering the Union at a time when the status of " Negroes" was very much in question, and wishing to stay out of the looming conflict between the Union and Confederate States, Oregon banned African Americans from moving into the state in the vote to adopt its Constitution (1858). This ban was not officially lifted until 1925; in 2002, additional language now considered racist was struck from the Oregon Constitution by the voters of Oregon. After Oregon was admitted to the Union, it began with a single member in the House of Representatives ( La Fayette Grover, who served in the 35th United States Congress for less than a month). Congressional apportionment led to the addition of new members following the censuses of 1890, 1910, 1940, and 1980. A detailed list of the past and present Congressional delegations from Oregon is available. The United States District Court for the District of Oregon hears Federal cases in the state. 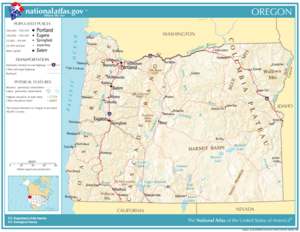 Oregon (among other western states and territories) is in the 9th judicial circuit. Oregon adopted many electoral reforms proposed during the Progressive Era, due to the efforts of William S. U'Ren and his Direct Legislation League. Under his leadership, the state overwhelmingly approved a ballot measure in 1902 that created the initiative and referendum processes for citizens to directly introduce or approve proposed laws or amendments to the state constitution. In following years, the primary election to select party candidates was adopted in 1904, and in 1908 the Oregon Constitution was amended to include recall of public officials. More recent amendments include the nation's only doctor-assisted suicide law, called the Death with Dignity law (which was challenged in 2005 by the Bush administration in the U.S. Supreme Court), legalization of medical marijuana, and among the nation's strongest anti-sprawl and pro-environment laws. In the U.S. Electoral College, Oregon casts seven votes. Oregon has supported Democratic candidates in the last five elections. Democratic presidential candidate John Kerry won the state in 2004 by a margin of four percentage points, with 51.4% of the popular vote. Urban Multnomah County's strong support of the Democratic candidate was slightly greater than the support for Republican candidate George W. Bush in the rest of the state. 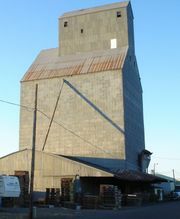 A warehouse in Halsey storing grass seed, one of the state's largest crops. The Willamette Valley is very fertile and, coupled with Oregon's famous rain, gives the state a wealth of agricultural products, including cattle, dairy products, potatoes, peppermint, hops and apples and other fruits. Oregon is also one of four major world hazelnut growing regions, and produces 95% of the domestic hazelnuts in the United States. While the history of the wine production in Oregon can be traced to before Prohibition, it became a significant industry beginning in the 1970s and in 2005 had the third most wineries in the U.S. with 303. Due to regional similarities of climate and soil, the grapes planted in Oregon are often the same varieties found in the French regions of Alsace and Burgundy. Vast forests have historically made Oregon one of the nation's major timber production and logging states, but forest fires (such as the Tillamook Burn), over-harvesting, and lawsuits over the proper management of the extensive federal forest holdings have reduced the amount of timber produced. According to the Oregon Forest Resources Institute, timber harvested from federal lands dropped some 96% from 1989 from 4,333 million to 173 million board feet (10,000,000 to 408,000 m³) in 2001. Even the shift in recent years towards finished goods such as paper and building materials has not slowed the decline of the timber industry. Examples include Weyerhaeuser's acquisition of Willamette Industries in January, 2002, the announcement by Louisiana Pacific in September, 2003 that they will relocate their corporate headquarters from Portland to Nashville, and the experiences of small lumber towns like Gilchrist. Despite these changes, Oregon still leads the United States in softwood lumber production; in 2001 6,056 million board feet (14,000,000 m³) was produced in Oregon, against 4,5257 mbf. in Washington, 2,731 in California, 2,413 in Georgia, and 2,327 in Mississippi. The effect of the forest industry crunch is still extensive unemployment in rural Oregon and is a bone of contention between rural and urban Oregon. Oregon is a popular location for shooting movies and television commercials. Movies wholly or partially filmed in Oregon include The Goonies, National Lampoon's Animal House, Stand By Me, Kindergarten Cop, One Flew Over the Cuckoo's Nest, Paint Your Wagon, The Hunted, Sometimes a Great Notion, Elephant, Bandits, The Ring 2, Short Circuit, Come See the Paradise, The Shining, Drugstore Cowboy, My Own Private Idaho and The Postman. Oregon native Matt Groening, creator of The Simpsons, has incorporated many references from his hometown of Portland into the TV series. Oregon's scenic coastal and mountain highways are frequently seen in automobile commercials. High technology industries and services have been a major employer since the 1970s. Tektronix was the largest private employer in Oregon until the late 1980s. Intel's creation and expansion of several facilities in eastern Washington County continued the growth that Tektronix had started. Intel, the state's largest private employer, operates four large facilities, with Ronler Acres, Jones Farm and Hawthorn Farm all located in Hillsboro. The spinoffs and startups that were produced by these two companies led to the establishment in that area of the so-called Silicon Forest. The recession and dot-com bust of 2001 hit the region hard; many high technology employers reduced the number of their employees or went out of business. OSDL made news in 2004 when they hired Linus Torvalds, developer of the Linux kernel. Recently, biotech giant Genentech purchased several acres of land in Hillsboro in an effort to expand its production capabilities. Oregon also is the home of large corporations in other industries such as shoemaker Nike, whose world headquarters is located in Beaverton. Medford is home to two of the largest mail order companies in the country: Harry and David Operations Corp. which sells gift items under several brands, and Musician's Friend an international catalog and Internet retailer of music gear. Portland is home to one of the West's largest trade book publishing houses, Graphic Arts Centre Publishing. Oregon had one of the largest salmon-fishing industries in the world, although ocean fisheries have reduced the river fisheries in recent years. Tourism is also strong in the state; Oregon's evergreen mountain forests, waterfalls, pristine lakes (including Crater Lake National Park), and scenic beaches draw visitors year round. The Oregon Shakespeare Festival, held in Ashland, is a tourist draw near its Californian border which complements the area's scenic beauty and opportunity for outdoor activities. Oregon's gross state product is $145.35 billion as of 2005. 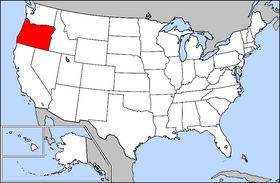 The centre of population of Oregon is located in Linn County, in the city of Lyons. 6.5% of Oregon's population were reported as under 5 years old, 24.7% under 18, and 12.8% were 65 or older. Females made up approximately 50.4% of the population. Typical of the Northwestern part of the United States, Oregon is second to only Washington State in percentage of people identifying themselves as "non-religious". Compare these values with the average values for the United States. The capital is Salem and the largest city is Portland. Eugene, home of the University of Oregon, is the third largest city, closely following Salem. Oregon City was the first incorporated city west of the Rockies and later, the first capital of the Oregon Territory, from 1848 to 1852, when the territorial capital was moved to Salem, Oregon. It was also the end of the Oregon Trail and the site of the first public library established west of the Rocky Mountains, stocked with only 300 volumes. The Oregon University System supports seven public universities and one affiliate in the state. The University of Oregon in Eugene is Oregon's flagship liberal arts institution, while Oregon State University in Corvallis is the flagship agricultural school. The State also has three regional universities: Western Oregon University in Monmouth, Southern Oregon University in Ashland, and Eastern Oregon University in La Grande. Portland State University is Oregon's largest and serves as the State's urban school in the Portland Metropolitan Area. The Oregon Institute of Technology has its campus in Klamath Falls. The affiliate Oregon Health and Science University (OHSU) comprises a medical, dental, and nursing school in Portland and a science and engineering school in Hillsboro (both graduate-only). Willamette University is the state's oldest university, established during the territorial period. Oregon has historically struggled to fund higher education. Recently, Oregon has cut its higher education budget over the last 5 years and now Oregon ranks 46th in the country in state spending per student. Oregon is home to a wide variety of private colleges, especially in the Portland area. The University of Portland is Oregon's Catholic university. Concordia University, Lewis & Clark College, Marylhurst University, Multnomah Bible College, Reed College, Warner Pacific College, and the National College of Natural Medicine are also in Portland. Pacific University is in the suburb of Forest Grove. There are also private colleges further south in the Willamette Valley. McMinnville has Linfield College, while nearby Newberg is home to George Fox University. Salem is home to two private schools, Willamette University and Corban College. 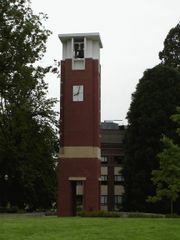 In addition to the University of Oregon, Eugene is home to the campuses of Northwest Christian College and Eugene Bible College. The only major professional sports team in Oregon is the Portland Trail Blazers of the National Basketball Association. Traditionally, they have been one of the most successful teams in the NBA in terms of both win-loss record and attendance. However, the team has run into personnel and financial issues in recent seasons, and the team's popularity has taken a hit. The Blazers play in the Rose Garden in Portland's Lloyd District. The Rose Garden's other tenants include the Portland Winter Hawks, a longstanding and popular Western Hockey League team, and the Portland LumberJax, an expansion National Lacrosse League team. In addition to the Winter Hawks and LumberJax, Portland has two more minor-league sports teams who play at PGE Park. The Portland Timbers of the USL First Division are a very popular soccer team, and the Portland Beavers of the Pacific Coast League are the Triple-A club of the San Diego Padres. There has been recent talk of Portland trying to get their own Major League Baseball team. Even with all of these professional options available, the state's two major college teams, the Oregon Ducks and Oregon State Beavers remain the most popular sports entities in the state. The Oregon-grape, Oregon's state flower. State motto: Alis Volat Propriis, Latin for “She Flies With Her Own Wings” (since 1987; This was the original motto of Oregon, but had been changed to “The Union” in 1957.